Preheat oven to 350°F. Spray a baking dish with nonstick spray. Bring a large pot of salted water to a boil. Boil the pasta until al-dente. You want it to have a bit of bite because it will finish cooking in the oven. Drain well. 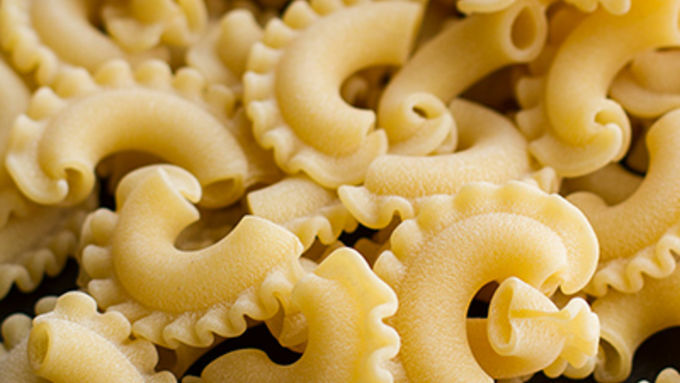 While the pasta boils, add 3 tablespoons butter to a skillet and melt over medium heat. Add the garlic and sauté 30 seconds then add in the lobster meat and sauté for 3-5 minutes. Add the parsley and cook another 30 seconds. Remove the lobster from the pan. Add another 2 tablespoon of butter to the skillet. Throw in the crushed Ritz crackers and toss to coat. Toast the crumbs for 3-5 minutes, stirring frequently to avoid burning. Once the crumbs are lightly toasted, remove from the heat and set aside. In the same pot you boiled the pasta, melt the remaining 4 tablespoons butter over medium heat. Whisk in the flour. Reduce the heat to medium-low and let cook and bubble for 1 minute, stirring once or twice to avoid burning. Gradually whisk in the milk and raise the heat up to medium-high. Bring the mixture to a boil, whisking frequently until the sauce has thickened, about 2-3 minutes. Remove from the heat and stir in all of the cheese, mustard powder, cayenne, salt and pepper. Stir until the cheese is fully melted. Stir in the pasta and about 3/4 of the lobster meat. Transfer to the prepared baking dish. Evenly sprinkle on the remaining lobster chunks and then the toasted cracker crumbs. Place the baking dish on a baking sheet. Remove from the oven and let sit five minutes. Dig in!! 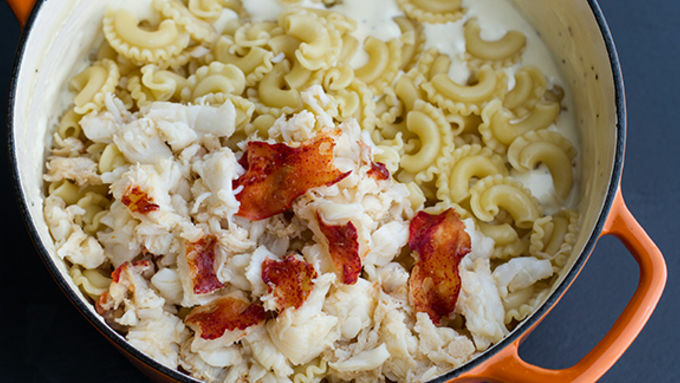 Mac and cheese with lobster? You better believe it. What you won't believe is how easy and creamy this is! If there is one thing that's fit for Valentine's Day, or really any cold February day, it's mac and cheese. But this mac and cheese is upping the ante. Why? 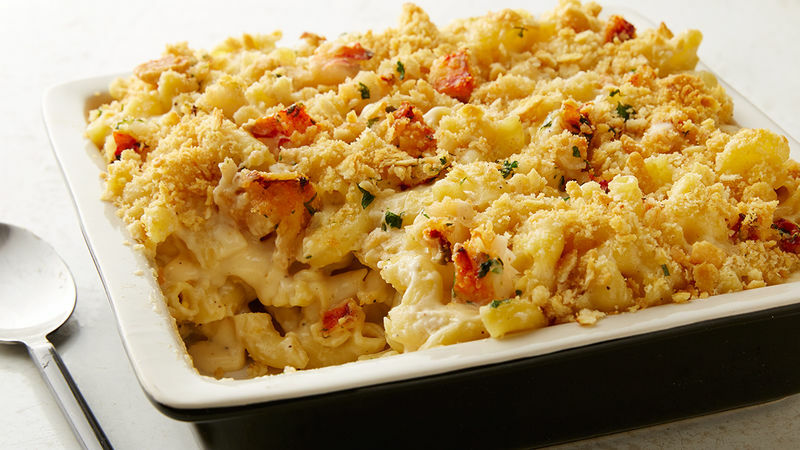 Well ... because we've added buttery lobster and fontina cheese. Oh yes we did. And it is just as amazing as it sounds. While we used this really fun shaped pasta, which worked perfectly for holding all the glorious cheese sauce – really any short-cut pasta will do. Make the béchamel sauce and add in all the cheese. This one's a mix of fontina, gruyere, sharp cheddar and brie. Yeah, brie. 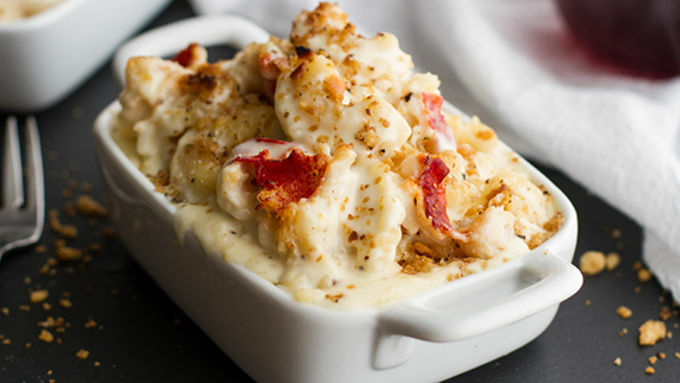 It is lobster mac and cheese, after all, so why not go all out? Spoon the mac and cheese into either one big casserole dish or a few individual dishes for a more romantic feel. And that‘s it – easy peasy! Nothing left to do but devour this amazing big bowl of the creamiest, richest, most decadent mac and cheese ever. Seriously, it is so good.On top of that, there's no doubt that you'll impress the very lucky receiver of this dish. And if you're making it for yourself? Well, just consider yourself very fortunate. Now you don’t even have to share! Just make it happen ... and then dig in.